I don’t know about you, but providing students access to high quality books is a struggle of mine. Actually, the challenge lies in providing the right kind of books – those books my students can read independently. Which means the school library is out. Don’t get me wrong, school libraries are an outstanding resource for children’s literature and nonfiction books, but my emergent readers and struggling students can’t yet read trade books on their own. A lot of my students don’t always have a fluent reader at home who can read to them either. Enter a take-home reading program! Students exchange books daily, one at a time, to read at home. Teachers assign students an independent reading level and volunteers check out appropriately leveled books in a quick and easy exchange system. As a student’s reading improves, her teacher assigns a new reading level based on a current running record. There’s a reason we use a student’s independent, and not her instructional, reading level in the take-home program. Students should be able to pick up and read any book checked out to them with little or no assistance to practice strong, fluent reading. We want parents and students to enjoy the reading process together with parents providing only hints now and then, not taking on the role of reading teacher. I’ve organized take-home reading programs at several schools and have had great success in providing children access to just right books. At one school we named the program “Reading Rodeo” since our school mascot was the mustang. This time around I chose the name “Book Groove”. I wanted a name that represented students getting into the habit of reading, but also a name that was not considered too immature as to turn off older students. Right now, Book Groove is tailored to kindergarten, first, and second grade readers. I designed the program with growth in mind, so that one day Book Groove will include digital books that older students can listen to on their iPods or read on their phones. I know my reluctant readers would love that! 1. Leveled books and a place to store them. 2. Reading assessment levels for student participants. 3. Volunteers to check out books. I’ve worked hard to collect and purchase appropriate books for take-home programs. It’s been the most time consuming part of the job! I’ve been able to secure grants from local and national businesses to fund most of the programs. I’ve found that grant givers are interested in funding programs that provide students with literacy experiences that connect the home and school. 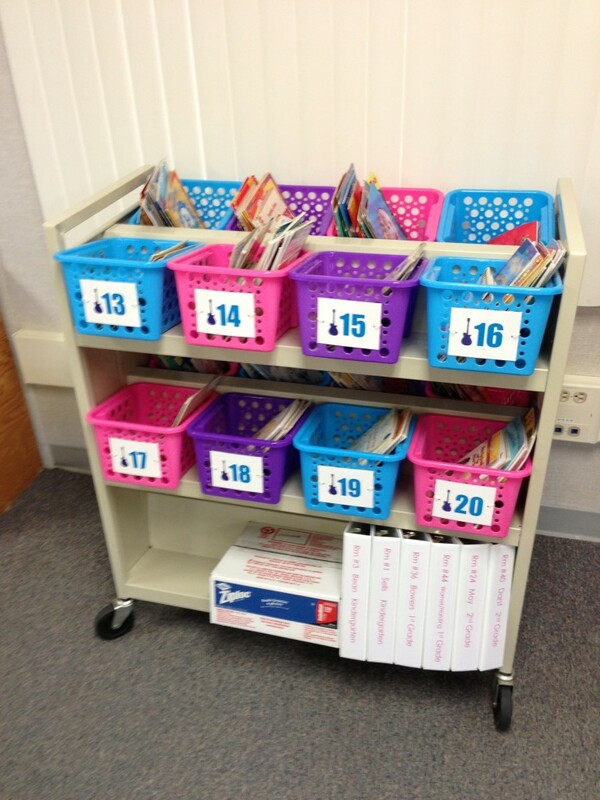 A tub for each participating class to hold books for check in and check out. 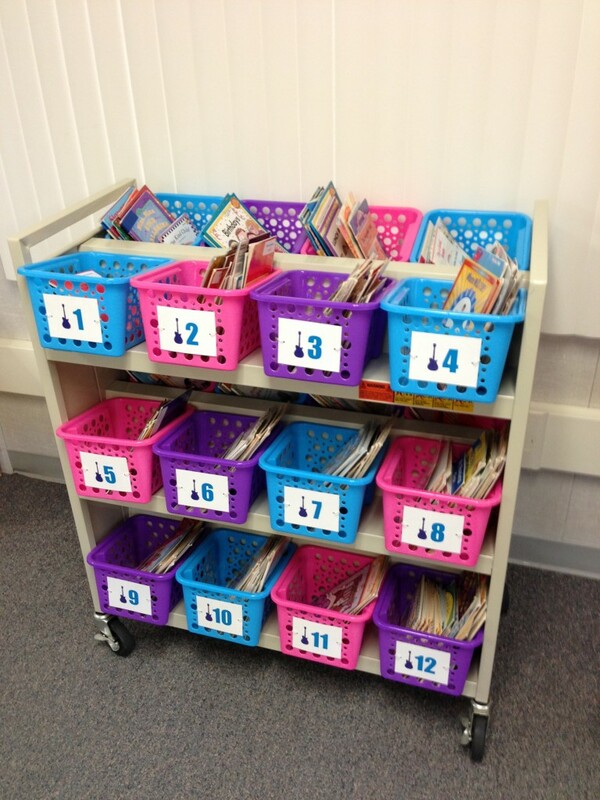 Book bins for each reading level. A binder for each class and one or two to hold extra check out sheets. Paper and post-it tabs to make binder dividers. The post-it tabs make it easy to add and remove students as needed. Gallon size Ziploc bags for students to carry their books. Don’t buy cheap zipper bags, the brand name bags are worth it! Printable address labels to label each book. Be sure to not cover any bar codes with labels! That way you can move to an electronic check out system in the future like I hope to do. At some schools I was able to find a room or closet to house the take-home book bins and check out supplies. This time I’m housing them in my classroom on a mobile library cart. Book Groove is still a small program right now, so I haven’t found it disruptive when volunteers come in to check out books to students. But larger programs do require a separate space away from busy classrooms. A large take-home program also requires coordination of volunteers. PTA parents are a great resource to draw up schedules and communicate with volunteers. Take-home programs offer parents and community members an easy, flexible way to help out their local school. I’ve recruited volunteers from our parents club, community organizations, our jr high school, our local university, you name it! It can be difficult for parents with small children to volunteer in classrooms but with a take-home program parents can bring their young child along with them. I’ve never found it to be disruptive. Take-home program volunteering can also be a great way to reach out to parents who sometimes hesitate to be involved in the classroom due to language barriers. Once I’ve taught parents the check out system, limited English skills no longer keep them from helping their child in school. Also, books can be checked out at any time during the school day, making take-home programs among the most flexible volunteer opportunities. I’ve had parents swing by the school on their lunch break to volunteer because they believe so much in the program! I generally ask teachers to include information about take-home programs in their classroom newsletters and to speak about them at parent information nights. I also include this letter in the students’ Ziploc bags the first time they take home a book. It’s translated into Spanish as well since many of our students speak Spanish at home. Consider starting a take-home reading program at your school. It’s well worth the effort and will last for years to come!